Terminology: Tar Sands or Oil Sands? Generally speaking, people who are opposed to the extraction of bitumen in NE Alberta prefer to refer to the sands as “tar sands”. The oil companies and the governments of Alberta and Canada prefer the sound of “oil sands”. “Bitumen sands” is in some ways more correct, but it’s a mouthful and not everybody will know what you are talking about. The one thing that everyone seems to agree upon is that “oil sands” sounds cleaner and nicer than “tar sands”. And it’s precisely this long string of negative historical associations that makes people profoundly distrustful of anything relating to oil, he said. Canadian Green Party Leader Elizabeth May and the Pembina Institute use “oil sands” or “oilsands”, so I am in respectable company. It is true that the name “tar sands” was the term used by early European explorers in Alberta. However, according to Wikipedia, “tar” in the nineteenth and early twentieth century referred to the by-product of the distillation of coal, and earlier than that, wood, and was mainly used for protecting and caulking wooden boats. People may object that the product we would recognize as oil is produced from the sandstones in Athabasca only after much refining. That’s true, but we have no problem with referring to chalcocite or malachite mining operations as “copper mines”. 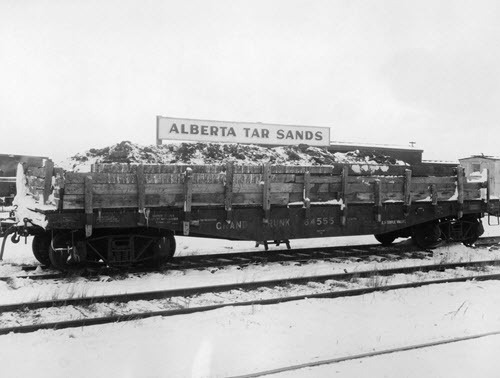 Once upon a time, it seems, the Alberta Government was perfectly happy with name “tar sands”. This entry was posted in Uncategorized and tagged Oil Sands, Politics. Bookmark the permalink.